Growing up in South Bend, Indiana, and educated from elementary through graduate school under the auspices of the Congregation of Holy Cross, Dr. Johnston received his B.A. in Theology and English, M.A. in Theology (Liturgy), and Ph.D. in Theology from the University of Notre Dame. He served in Church ministry in the Diocese of Richmond as the Minister of Religious Education at Holy Cross Parish, Lynchburg, VA; in the Archdiocese of Baltimore as Coordinator for Adult Initiation and Catechesis, as well as Associate Director and then Director of the Archdiocesan Office of RENEW; and in the Diocese of Grand Rapids as Coordinator of Formation, and Director of the Department of Christian Life and Ministry Formation. During this time he had varying roles in the development of three documents published by the U.S. Catholic Bishops — Our Hearts Were Burning Within Us, the National Directory for Catechesis, and Co-Workers in the Vineyard of the Lord. He also served on the Board of Directors of NALM (the National Association for Lay Ministry), with terms as Vice-Chair and as Chair. From 2007–2011 he chaired the Task Force for the Revision of the National Certification Standards, a project of the Alliance for the Certification of Lay Ecclesial Ministers (member organizations of ACLEM are NALM, NFCYM, NCCL, NPM, and FDLC – see http://www.lemcertification.org). During the late 1990s he was a member and Co-Secretary of NACARE (the National Advisory Committee on Adult Religious Education of the then-USCC Department of Education). Since 2001 he has been on the Advisory Board of the Worship Renewal Grants Program of the Calvin Institute of Christian Worship, Calvin College (Grand Rapids, MI). 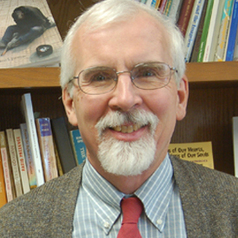 After twenty-seven years in Church ministry, Dr. Johnston joined the faculty of the Department of Religious Studies in 2006, with specific responsibilities in the area of pastoral ministry. He currently serves as Director of MA Programs for the Department.